BIE involves the participation of excellences in the metalworking sector at the international level with the display of innovative products. Automazioni Industriali S.r.l. 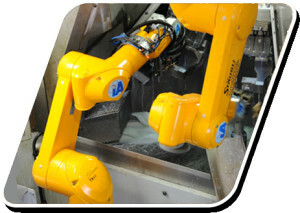 was founded in Lumezzane (BS) in 1984 to operate in the field of applied robotics. Born in one of the main industrial areas in the province of Brescia, it has always been one of the company’s priorities to look ahead into the future of highly advanced technologies. Lucchini RS is a steel manufacturing group which offers a diversified range of high-tech products and services and operates globally. The group’s core business is the production of high-end railway components – wheels, axles and wheelsets for high-speed applications, locomotives, passenger trains, trams and underground trains. Mamè Group is an Italian group active in the production of forged steel. It consist of manufacturing companies and service providers that cover the entire supply chain for these types of products: from sale to production and distribution. The Tree of Life was the symbol of Expo 2015 and the Italian Pavillon. This massive steel-and-wood structure standed in the Lake Arena, a body of water surrounded by extensive terraced stands and the largest open space in the area. The Tree of Life was built by the “Orgoglio Brescia” Consortium, composed by 18 companies.